FAYETTEVILLE, NC — President-elect Donald Trump on Tuesday officially announced plans to nominate retired Marine Gen. James Mattis as Defense Secretary, touting him as a man who "plays no games." Mattis, Trump declared, is "the living embodiment of the Marine Corps motto semper fidelis, always faithful. And the American people are fortunate a man of this character and integrity will now be the civilian leader atop of the Department of Defense." Mattis stood alongside Trump as he made the announcement and was met with scattered dog barks from a favorable crowd that cheered the pick. In praising Mattis, Trump mentioned his role leading forces in Iraq and during the Gulf War, saying of Mattis’ performance in the latter, "that’s the way you’re supposed to lead it — no games." "Mad Dog Mattis plays no games," Trump added. 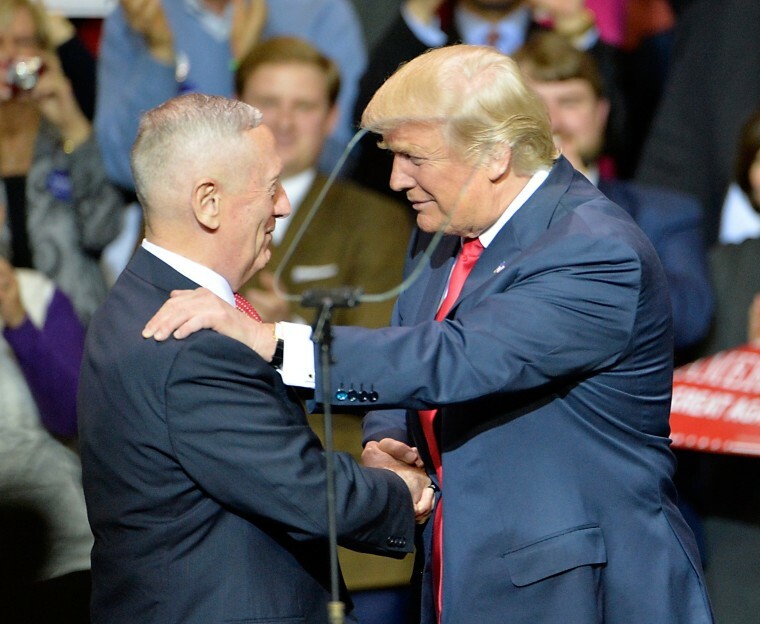 The pick came as no surprise — Trump first announced plans to nominate Mattis at the first rally of his "Thank You" tour, last week in Cincinnati, Ohio. Trump’s decision has been met with enthusiasm from Republicans, who view the tough-talking Marine general as an experienced, thoughtful and hawkish choice for the role. He’s considered a hardliner on Iran and is sure to appeal to Trump’s supporters who see his pledge to rip up the Iran deal as a key priority. Trump promised Tuesday night that "under [Mattis’] leadership ... we will rebuild our military and alliances, destroy terrorists, face our enemies head on and make America safe again." But a major hurdle remains to Mattis’ confirmation — his military service. A 1947 law requires military officers be retired for seven years before heading up the Defense Department; Mattis has only been retired for three, and would need a waiver from Congress to serve. In his own brief remarks, Mattis said he was “grateful for the opportunity to return to our troops, their families, the civilians of the Department of Defense,” but acknowledged that hurdle. "With our allies strengthened, with our country strengthened, I look forward to being the civilian leader, so long as the Congress gives me the waiver and the Senate votes to consent,” he said. Trump came on afterwards and insisted Mattis would get the waiver, warning “oh, if he didn't get that waiver, there'll be a lot of angry people." And House Republicans late Tuesday released a short-term spending bill to keep the government funded through April — coupled with language that would allow Mattis to be secretary. Trump opened his speech — at an arena just miles from Fort Bragg military base — with a rundown of his plans to rebuild the military, reign in military involvement in foreign conflicts and reform the VA. The U.S. will “stop racing to topple foreign regimes that we know nothing about that we shouldn’t be involved with — instead our focus must be defeating terrorism and destroying ISIS, and we will." Trump also said the U.S. military wouldn’t be “depleted” anymore, telling the crowd he’d ask Congress to eliminate the sequestration budget caps on defense spending. “All men and women in uniform will have the supplies, support, equipment, training services, medical care and resources they need to get the job done incredibly well and perfectly,” Trump pledged.